Residential interior designers needing their design vision achieved with intricately sewn home finishings will experience flawless customer installations and pride in your reputation. Quality ensures a finished project with payment and customer satisfaction for new projects in their home. You know your customer is pleased when they are ready to plan the next project with you after such a successful installation. 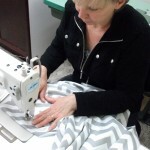 With over 14 years experience, retaining many designers over 10 years, my work has been featured in Style at Home and has been juried and approved as a recommended sewing service at Designer Fabrics. I welcome new designers and will work diligently with you during the quoting process to assist with your client contracts. Please give my services a try!